The Association of Visual Arts and Art lovers of Kavala are organizing a charity exhibition-bazaar in the Public Tobacco Warehouse. 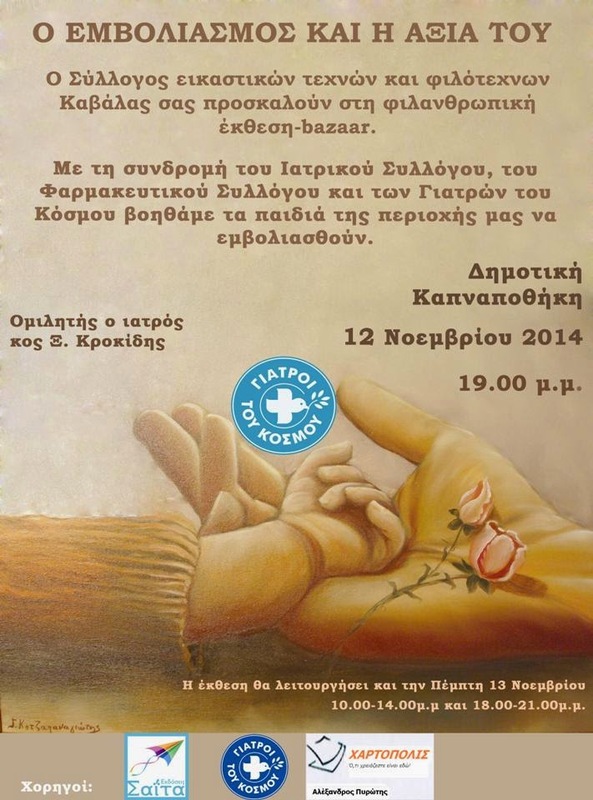 The event will take place on Wednesday, 12th of November at 7pm. In association with the Medical Association, the Pharmaceutical Association and the Doctors of the World (Γιατροί του Κόσμου), they will help the children of the area to get vaccinated. The Guest Speaker for the bazaar will be Dr. Krokidis. The bazaar will also take place on Thursday, 13th of November from 10 am to 2pm and then at 4pm till 7pm. Part of the income will be used for purchasing vaccines. Saita Publications is the media sponsor for this initiative.